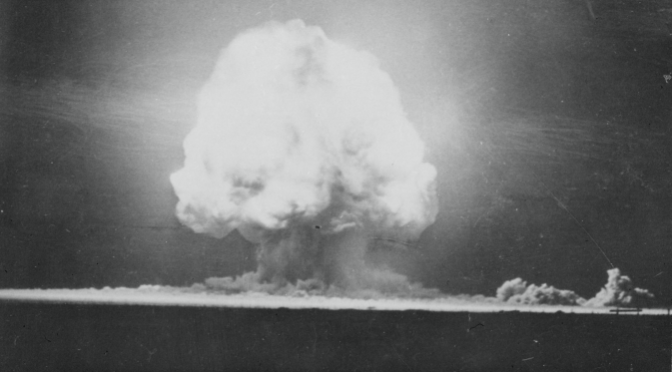 look here buy strattera Seventy years ago today at 0529 hours and 21 seconds Mountain War Time (equivalent to today’s DST, 0729 Eastern Daylight Time), the military personnel and civilian scientists of the Manhattan Project succeeded in their goal of producing a nuclear explosive. In the seventy intervening years, other nations have achieved nuclear capability – both declared and undeclared. In the seventy intervening years, the threat of using nuclear weapons has saved humanity from continental- or global-scale conflict. Today, we are (still) dealing with issues of nuclear proliferation to nations on the fringe of modern civilization like Iran and North Korea. Our own resolve and political will to maintain strategic deterrence is in question, when our own President has publicly said he’d like to see a world without nuclear weapons while our primary geopolitical adversary, Russia, has a strategic modernization well underway. I, for one, do not want to return to the world before Trinity. A strong America, willing to employ nuclear weapons in combat, ended World War II without the millions of dead that an invasion of Japan would have caused – civilian casualties that could have rivaled all of the rest of World War II combined. A resolved America, which built and regularly demonstrated that it was ready to use in war a nuclear arsenal if necessary, helped keep these most horrific of weapons unused since 1945. Over the last twenty-plus years since the assumed end of the Cold War, our nuclear arsenal has waned and its readiness and importance in the minds of our warriors has diminished. We are not safer for the change.